dbo25.usp_export_all This procedure exports all data. dbo25.usp_export_currency_rates This procedure exports currency rates. dbo25.usp_export_dimensions This procedure exports dimensions. dbo25.usp_export_facts This procedure exports source numbers. dbo25.usp_export_forms This procedure exports forms and form settings. dbo25.usp_export_members This procedure exports members. dbo25.usp_export_strings This procedure exports source strings. dbo25.usp_export_tax_rates This procedure exports tax rates. dbo25.usp_export_units This procedure exports units. dbo25.usp_import_clear_all_data This procedure clears all data before importing data. dbo25.usp_import_currency_rates This procedure imports currency rates. dbo25.usp_import_dimension This procedure imports dimensions. dbo25.usp_import_dimension_calc_types This procedure imports calculation types by dimensions. dbo25.usp_import_dimension_properties This procedure imports dimension properties. dbo25.usp_import_fact This procedure imports source numbers. dbo25.usp_import_form This procedure imports forms. dbo25.usp_import_form_dimension This procedure imports form dimension properties. dbo25.usp_import_form_permissions This procedure imports form permissions. dbo25.usp_import_form_row This procedure imports custom form rowsets. dbo25.usp_import_form_subtotals This procedure imports form subtotal settings. dbo25.usp_import_member This procedure imports dimension members. dbo25.usp_import_member_parent This procedure imports member parents. dbo25.usp_import_member_permissions This procedure imports member permissions. dbo25.usp_import_member_properties This procedure imports member properties. dbo25.usp_import_member_relations This procedure imports member relations. dbo25.usp_import_string This procedure imports source strings. dbo25.usp_import_tax_rates This procedure imports tax rates. dbo25.usp_import_unit This procedure imports units. dbo25.xl_actions_create_standard_members This procedure creates standard dimension members. dbo25.xl_actions_set_role_permissions This procedure grants permissions to the planning application roles. xls25.usp_calc_types This procedure is an Excel form for editing calculation types. xls25.usp_closed_periods This procedure is an Excel form for editing closed periods. xls25.usp_closed_periods_change This procedure updates a database on cell changes of xls25.usp_closed_periods. xls25.usp_currency_rates This procedure is an Excel form for editing currency rates. xls25.usp_currency_rates_change This procedure updates a database on cell changes of xls25.usp_rates. xls25.usp_data_management This procedure is an Excel form for data management. xls25.usp_dimensions This procedure is an Excel form for editing dimensions. xls25.usp_dimensions_change This procedure checks user input on cell changes of xls25.usp_dimensions. xls25.usp_dimensions_delete This procedure deletes rows of xls25.usp_dimensions. xls25.usp_dimensions_insert This procedure inserts rows of xls25.usp_dimensions. xls25.usp_dimensions_update This procedure updates rows of xls25.usp_dimensions. 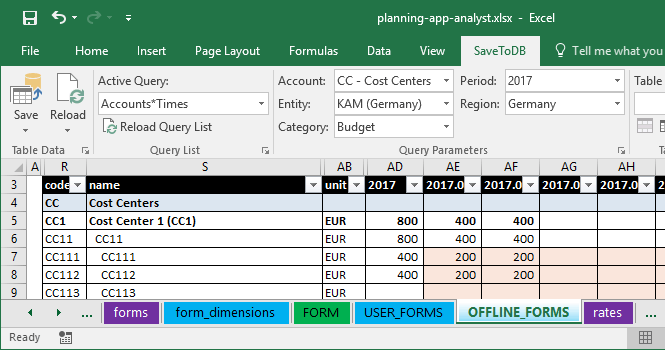 xls25.usp_form_dimensions This procedure is an Excel form for editing form dimension properties. xls25.usp_form_dimensions_delete This procedure deletes rows of xls25.usp_form_dimensions. xls25.usp_form_dimensions_insert This procedure inserts rows of xls25.usp_form_dimensions. xls25.usp_form_dimensions_update This procedure updates rows of xls25.usp_form_dimensions. xls25.usp_form_permissions This procedure is an Excel form for editing form permissions. xls25.usp_form_permissions_change This procedure updates a database on cell changes of xls25.usp_form_permissions. xls25.usp_form_rows This procedure is an Excel form for editing form rowsets. xls25.usp_form_rows_delete This procedure deletes rows of xls25.usp_form_rows. xls25.usp_form_rows_insert This procedure inserts rows of xls25.usp_form_rows. xls25.usp_form_rows_update This procedure updates rows of xls25.usp_form_rows. xls25.usp_forms This procedure is an Excel form for editing a list of forms. xls25.usp_forms_delete This procedure deletes rows of xls25.usp_forms. xls25.usp_forms_insert This procedure inserts rows of xls25.usp_forms. xls25.usp_forms_update This procedure updates rows of xls25.usp_forms. 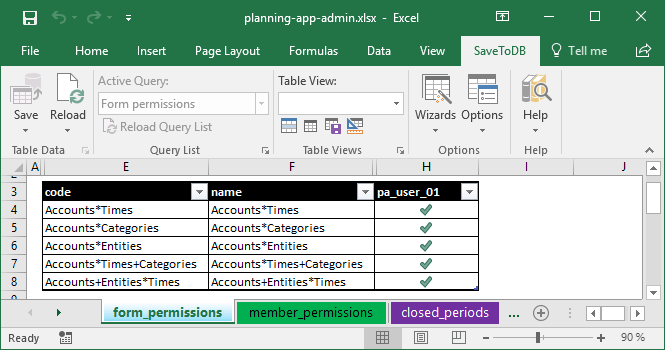 xls25.usp_member_permissions This procedure is an Excel form for editing member permissions. xls25.usp_member_permissions_change This procedure updates a database on cell changes of xls25.usp_member_permissions. xls25.usp_member_relations This procedure is an Excel form for editing member relations. xls25.usp_member_relations_change This procedure updates a database on cell changes of xls25.usp_member_relations. xls25.usp_members This procedure is an Excel form for editing dimension members. xls25.usp_members_delete This procedure deletes rows of xls25.usp_members. xls25.usp_members_insert This procedure inserts rows of xls25.usp_members. xls25.usp_members_update This procedure updates rows of xls25.usp_members. xls25.usp_rowsets This procedure is an Excel form for editing rowset members. xls25.usp_rowsets_delete This procedure deletes rows of xls25.usp_rowsets. xls25.usp_rowsets_insert This procedure inserts rows of xls25.usp_rowsets. xls25.usp_rowsets_update This procedure updates rows of xls25.usp_rowsets. xls25.usp_run_form This procedure executes forms configured using dbo25.forms and dbo25.form_dimensions. xls25.usp_run_form_change This procedure updates a database on cell changes of xls25.usp_run_form. xls25.usp_run_json_form This procedure returns calculated cube data requested with JSON parameters. xls25.usp_run_offline_form This procedure executes forms configured using dbo25.forms and dbo25.form_dimensions. xls25.usp_run_offline_form_delete This procedure deletes rows of xls25.usp_run_offline_form. xls25.usp_run_offline_form_insert This procedure inserts rows of xls25.usp_run_offline_form. xls25.usp_run_offline_form_update This procedure updates rows of xls25.usp_run_offline_form. xls25.usp_tax_rates This procedure is an Excel form for editing tax rates. xls25.usp_units This procedure is an Excel form for editing units. xls25.xl_actions_add_cash_flow_example This procedure adds members and settings of the cash flow example. xls25.xl_actions_add_cost_center_example This procedure adds members and settings of the cost center example. xls25.xl_actions_add_quarters This procedure adds quarter members. xls25.xl_actions_add_year This procedure adds year members. xls25.xl_actions_copy_data This procedure copies data from a category to category. xls25.xl_actions_delete_data This procedure deletes source cube data from a category. xls25.xl_actions_delete_year This procedure deletes year members. xls25.xl_actions_run_form_cell_data This procedure selects underlying cube data for a reporting cell. xls25.xl_actions_set_system_currency This procedure changes the system currency of the application. xls25.xl_actions_update_facts This procedure updates cube values after currency rate changes. xls25.xl_actions_update_hierarchies This procedure updates required tables after member changes. xls25.xl_actions_update_member_permissions This procedure updates member permissions after member changes. xls25.xl_parameter_values_0_or_1 This procedure selects 0 or 1 for Excel ribbon parameters. xls25.xl_parameter_values_calc_type_id This procedure selects calculation types for Excel ribbon parameters. xls25.xl_parameter_values_calc_type_id_or_null This procedure selects calculation types for Excel ribbon parameters. 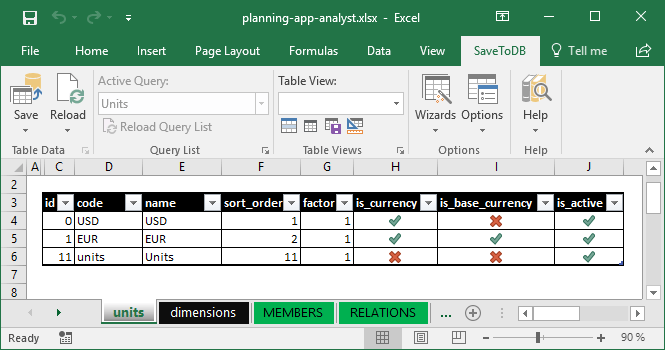 xls25.xl_parameter_values_currency_id This procedure selects currencies for Excel ribbon parameters. xls25.xl_parameter_values_dimension_id This procedure selects dimensions for Excel ribbon parameters. xls25.xl_parameter_values_dimension_id_or_null This procedure selects dimensions for Excel ribbon parameters. xls25.xl_parameter_values_form_id This procedure selects forms for Excel ribbon parameters. xls25.xl_parameter_values_form_id_or_null This procedure selects forms for Excel ribbon parameters. xls25.xl_parameter_values_member_id_by_dimension_id This procedure selects members for Excel ribbon parameters. xls25.xl_parameter_values_member_id_dim1 This procedure selects 1st dimension members for Excel ribbon parameters. xls25.xl_parameter_values_member_id_dim2 This procedure selects 2nd dimension members for Excel ribbon parameters. xls25.xl_parameter_values_member_id_dim3 This procedure selects 3rd dimension members for Excel ribbon parameters. xls25.xl_parameter_values_member_id_dim4 This procedure selects 4th dimension members for Excel ribbon parameters. xls25.xl_parameter_values_member_id_dim5 This procedure selects 5th dimension members for Excel ribbon parameters. xls25.xl_parameter_values_member_id_dim6 This procedure selects 6th dimension members for Excel ribbon parameters. xls25.xl_parameter_values_member_id_dim7 This procedure selects 7th dimension members for Excel ribbon parameters. xls25.xl_parameter_values_relation_dimension_id This procedure selects dimensions for Excel ribbon parameters. 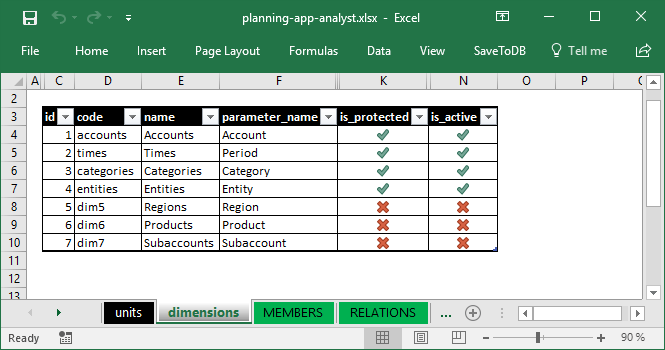 xls25.xl_parameter_values_relation_partner_id This procedure selects members for Excel ribbon parameters. xls25.xl_parameter_values_root_member_id This procedure selects possible root members for Excel ribbon parameters. xls25.xl_parameter_values_rowset_id This procedure selects rowsets for Excel ribbon parameters. xls25.xl_parameter_values_rowset_id_or_null This procedure selects rowsets for Excel ribbon parameters. xls25.xl_parameter_values_run_form_p This procedure selects values for the ribbon parameters of the configured forms. xls25.xl_parameter_values_run_form_p1 This procedure selects values for the 1st ribbon parameter of the configured forms. xls25.xl_parameter_values_run_form_p2 This procedure selects values for the 2nd ribbon parameter of the configured forms. xls25.xl_parameter_values_run_form_p3 This procedure selects values for the 3rd ribbon parameter of the configured forms. xls25.xl_parameter_values_run_form_p4 This procedure selects values for the 4th ribbon parameter of the configured forms. xls25.xl_parameter_values_run_form_p5 This procedure selects values for the 5th ribbon parameter of the configured forms. xls25.xl_parameter_values_run_form_p6 This procedure selects values for the 6th ribbon parameter of the configured forms. xls25.xl_parameter_values_run_form_p7 This procedure selects values for the 7th ribbon parameter of the configured forms. xls25.xl_parameter_values_unit_id This procedure selects units for Excel ribbon parameters. xls25.xl_parameter_values_username This procedure selects usernames for Excel ribbon parameters. xls25.xl_validation_list_axis_type_id This procedure selects axis types to use as an Excel validation list source. xls25.xl_validation_list_calc_type_id_by_dimension_id This procedure selects calculation types to use as an Excel validation list source. xls25.xl_validation_list_default_member_id This procedure selects possible default members to use as an Excel validation list source. xls25.xl_validation_list_dimension_id This procedure selects dimensions to use as an Excel validation list source. xls25.xl_validation_list_member_id This procedure selects members to use as an Excel validation list source. xls25.xl_validation_list_member_id_by_dimension_id This procedure selects members to use as an Excel validation list source. xls25.xl_validation_list_member_id_by_rowset_id This procedure selects members to use as an Excel validation list source. xls25.xl_validation_list_name_format_id This procedure selects name formats to use as an Excel validation list source. xls25.xl_validation_list_previous_period_id_by_dimension_id This procedure selects previous period members to use as an Excel validation list source. xls25.xl_validation_list_root_member_id This procedure selects possible root members to use as an Excel validation list source. xls25.xl_validation_list_root_member_or_rowset_id This procedure selects possible root members to use as an Excel validation list source. xls25.xl_validation_list_rowset_id This procedure selects rowsets to use as an Excel validation list source. xls25.xl_validation_list_same_period_id_by_dimension_id This procedure selects same period members to use as an Excel validation list source. xls25.xl_validation_list_tax_rate_id_by_dimension_id This procedure selects tax rates to use as an Excel validation list source. xls25.xl_validation_list_unit_id_by_dimension_id This procedure selects units to use as an Excel validation list source. This procedure exports all data. It calls other export procedures in the right order to prepare the complete import SQL script. This procedure exports currency rates. This procedure exports source numbers. This procedure exports forms and form settings. Source tables: dbo25.members, dbo25.parents, dbo25.member_relations, dbo25.member_permissions. This procedure exports source strings. This procedure exports tax rates. This procedure clears all data before importing data. You may clear all the data to create a complete copy of the exported application. The procedure does not delete dimensions. This procedure imports currency rates. This procedure imports calculation types by dimensions. This procedure imports dimension properties. Call this procedure after importing dimension members. This procedure imports source numbers. The procedure sets the same value into the value and source_value fields. Use the xls25.xl_actions_update_facts procedure to calculate values that depend on unit factors and currency rates. This procedure imports form dimension properties. This procedure imports form permissions. This procedure imports custom form rowsets. This procedure imports form subtotal settings. This procedure imports dimension members. This procedure imports member parents. This procedure imports member permissions. This procedure imports member properties. This procedure imports member relations. This procedure imports source strings. This procedure imports tax rates. This procedure creates standard dimension members. Use it to initialize the empty cube. The procedure uses the dbo25.get_standard_members function to select standard members. This procedure grants permissions to the planning application roles. Execute this procedure if you recreated any table of the dbo25 schema. This procedure is an Excel form for editing calculation types. This procedure is an Excel form for editing closed periods. Editing data requires the SaveToDB Enterprise edition. This procedure updates a database on cell changes of xls25.usp_closed_periods. This procedure is an Excel form for editing currency rates. This procedure updates a database on cell changes of xls25.usp_rates. This procedure is an Excel form for data management. 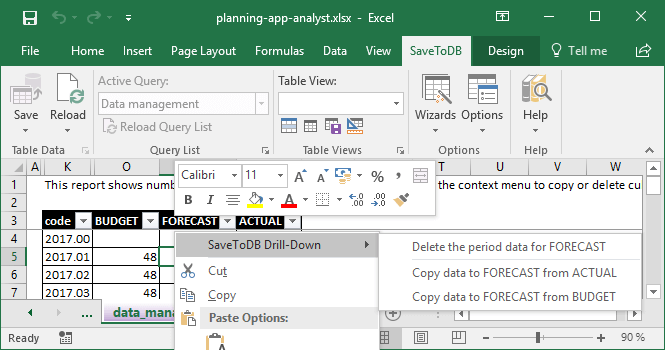 Use the Excel context menu to delete and copy data. This procedure is an Excel form for editing dimensions. This procedure checks user input on cell changes of xls25.usp_dimensions. The procedure just checks the changes. It does not save any data. This procedure deletes rows of xls25.usp_dimensions. The procedure blocks deleting dimensions and raises an exception. Use an SQL command to delete a dimension. This procedure inserts rows of xls25.usp_dimensions. The procedure blocks inserting dimensions and raises an exception. Use an SQL command to insert a dimension. However, note that you have to modify the application code also. This procedure updates rows of xls25.usp_dimensions. This procedure is an Excel form for editing form dimension properties. The form selects dbo25.forms cross dbo25.dimensions. This procedure deletes rows of xls25.usp_form_dimensions. This procedure inserts rows of xls25.usp_form_dimensions. This procedure updates rows of xls25.usp_form_dimensions. 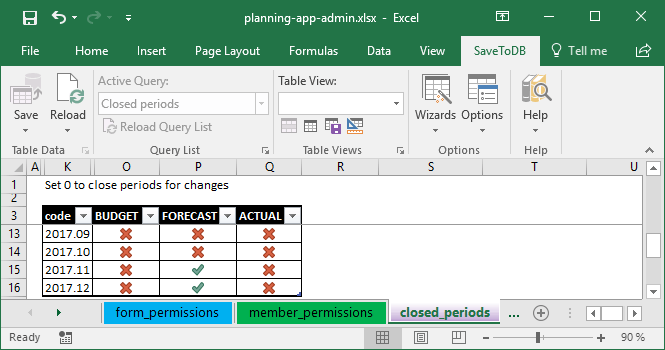 This procedure is an Excel form for editing form permissions. This procedure updates a database on cell changes of xls25.usp_form_permissions. This procedure is an Excel form for editing form rowsets. 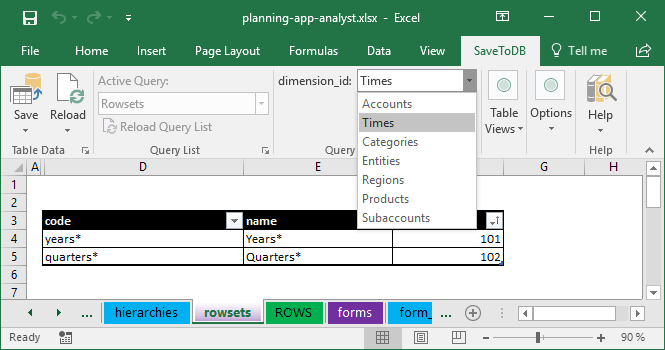 Note that you may create rowsets to use in rows and columns. This procedure deletes rows of xls25.usp_form_rows. This procedure inserts rows of xls25.usp_form_rows. This procedure updates rows of xls25.usp_form_rows. This procedure is an Excel form for editing a list of forms. This procedure deletes rows of xls25.usp_forms. This procedure inserts rows of xls25.usp_forms. This procedure updates rows of xls25.usp_forms. 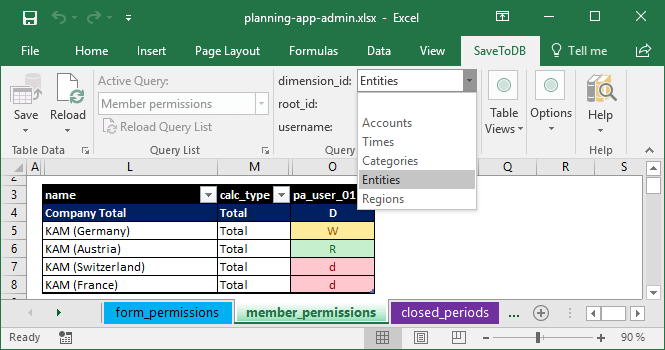 This procedure is an Excel form for editing member permissions. Type "r", "w", or "d" to change permissions. The application applies for new permissions immediately after changes. This procedure updates a database on cell changes of xls25.usp_member_permissions. This procedure is an Excel form for editing member relations. This procedure updates a database on cell changes of xls25.usp_member_relations. This procedure is an Excel form for editing dimension members. Use the Actions menu to add typical members. After saving data click Actions, Update Hierarchies, then Reload, Reload Data and Configuration. 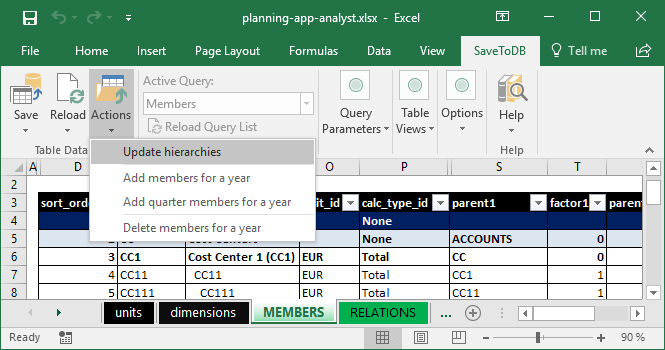 These actions update member hierarchies and reload new members into Microsoft Excel. This procedure deletes rows of xls25.usp_members. This procedure inserts rows of xls25.usp_members. This procedure updates rows of xls25.usp_members. This procedure is an Excel form for editing rowset members. The form shows members of the dbo25.members table with calc_type_id = 9 (rowset). You may add new rowsets here. Use the xls25.usp_form_rows procedure to edit rowset rows. We recommend adding the asterisk at the end of codes and names to distinguish rowsets from regular hierarchy members. This procedure deletes rows of xls25.usp_rowsets. This procedure inserts rows of xls25.usp_rowsets. This procedure updates rows of xls25.usp_rowsets. This procedure executes forms configured using dbo25.forms and dbo25.form_dimensions. This procedure is a form engine. 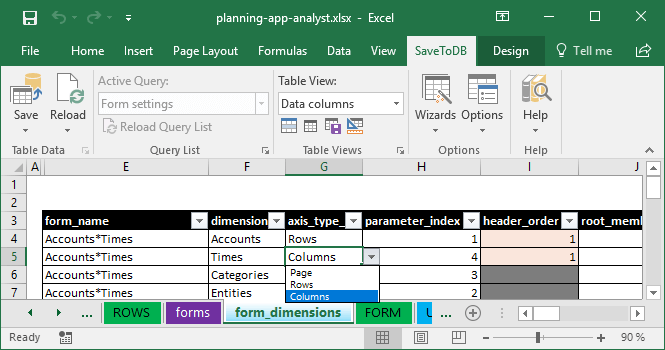 It returns the form layout configured using the dbo25.forms, dbo25.form_dimenstions, dbo25.form_rows, and dbo25.form_subtotals tables. The form may have up to thee dimensions in rows and up to three in columns. Other dimensions must have member id values at the ribbon. Ribbon parameters are dynamic and configured using dbo25.form_dimensions. 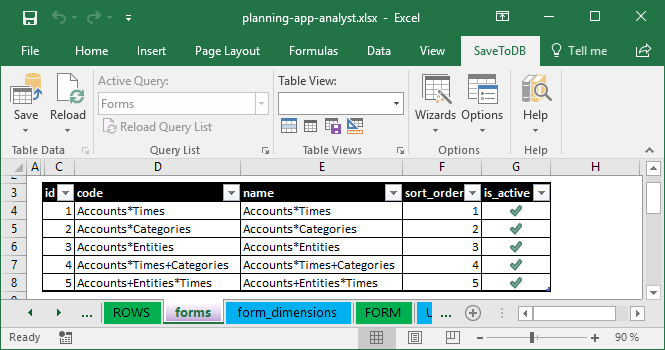 The Excel form has the cell change handler, xls25.usp_run_form_change, that updates underlying data. This form requires the SaveToDB Enterprise edition. You may use the offline form, xls25.usp_run_offline_form, with the SaveToDB Standard edition. This is the most complicated procedure. If you need new features, you may contact us. This procedure updates a database on cell changes of xls25.usp_run_form. @column_name nvarchar(255) IN Excel cell column name. Data column names contain dimension member codes separated by spaces. 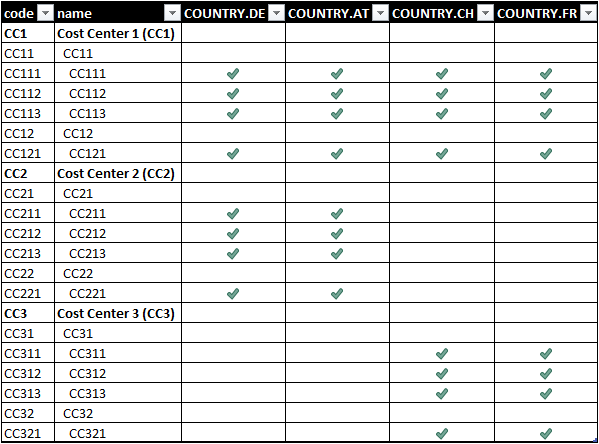 @changed_cell_index int IN Cell index in the changed cells, starting 1. The last cell has the index equal to @changed_cell_count. Note that this feature is available in the SaveToDB Enterprise edition only. This procedure returns calculated cube data requested with JSON parameters. @request nvarchar(max) IN Form parameters in the JSON format. You may use this procedure to create web forms. See usage examples in the procedure code. This procedure is an offline form engine. It calls xls25.usp_run_form internally and has the same output features. However, it has a different saving configuration. A user must click the Save button to save changes. So, the user may edit data offline and save the changes when required. This procedure deletes rows of xls25.usp_run_offline_form. The procedure does nothing as users cannot delete the form rows. This procedure inserts rows of xls25.usp_run_offline_form. The procedure does nothing as users cannot add form rows. This procedure updates rows of xls25.usp_run_offline_form. This procedure is an Excel form for editing tax rates. This procedure is an Excel form for editing units. 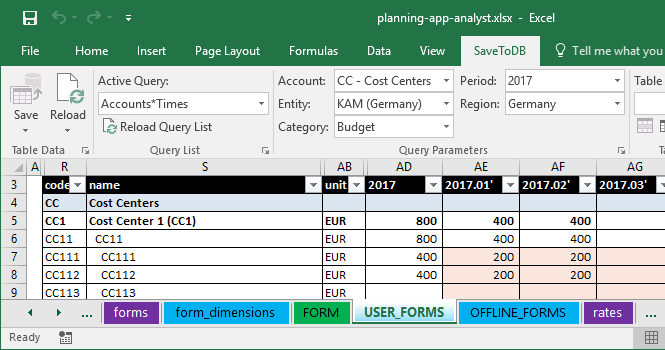 Use the Excel context menu to change the system currency (the unit with id 0). This procedure adds members and settings of the cash flow example. This procedure adds members and settings of the cost center example. This procedure adds quarter members. Use this procedure if you need only years and quarters but not months. This procedure adds year members. Use this procedure if you need years, quarters, and months. This procedure copies data from a category to category. For example, you may use this procedure to copy BUDGET data to FORECAST, or just create a copy of the budget data. The procedure does not copy string data. This procedure deletes source cube data from a category. This procedure deletes year members. Delete the cube data of the required year before deleting the members. This procedure selects underlying cube data for a reporting cell. This procedure is used in the Excel context menu to drill-down cell values. This procedure changes the system currency of the application. This procedure updates cube values after currency rate changes. This procedure updates required tables after member changes. This procedure updates member permissions after member changes. This procedure selects 0 or 1 for Excel ribbon parameters. Use this procedure in the xls.handlers table for parameters that accept 0 or 1 only. You do not need to use for parameters with the bit datatype. The SaveToDB add-in suggests 1 (yes) and 0 (no) values by default. This procedure selects calculation types for Excel ribbon parameters. This procedure selects currencies for Excel ribbon parameters. This procedure selects dimensions for Excel ribbon parameters. This procedure selects forms for Excel ribbon parameters. This procedure selects members for Excel ribbon parameters. This procedure selects 1st dimension members for Excel ribbon parameters. This procedure selects 2nd dimension members for Excel ribbon parameters. This procedure selects 3rd dimension members for Excel ribbon parameters. This procedure selects 4th dimension members for Excel ribbon parameters. This procedure selects 5th dimension members for Excel ribbon parameters. This procedure selects 6th dimension members for Excel ribbon parameters. This procedure selects 7th dimension members for Excel ribbon parameters. This procedure selects possible root members for Excel ribbon parameters. This procedure selects rowsets for Excel ribbon parameters. This procedure selects values for the ribbon parameters of the configured forms. This procedure selects values for the 1st ribbon parameter of the configured forms. This procedure selects values for the 2nd ribbon parameter of the configured forms. This procedure selects values for the 3rd ribbon parameter of the configured forms. This procedure selects values for the 4th ribbon parameter of the configured forms. This procedure selects values for the 5th ribbon parameter of the configured forms. This procedure selects values for the 6th ribbon parameter of the configured forms. This procedure selects values for the 7th ribbon parameter of the configured forms. This procedure selects units for Excel ribbon parameters. This procedure selects usernames for Excel ribbon parameters. The procedure selects usernames of members of the planning_app_users role only. To manage users, grant the VIEW DEFINITION permission. Other permissions are not required. This procedure selects axis types to use as an Excel validation list source. This procedure selects calculation types to use as an Excel validation list source. This procedure selects possible default members to use as an Excel validation list source. This procedure selects dimensions to use as an Excel validation list source. This procedure selects members to use as an Excel validation list source. This procedure selects name formats to use as an Excel validation list source. This procedure selects previous period members to use as an Excel validation list source. This procedure selects possible root members to use as an Excel validation list source. This procedure selects rowsets to use as an Excel validation list source. This procedure selects same period members to use as an Excel validation list source. This procedure selects tax rates to use as an Excel validation list source. This procedure selects units to use as an Excel validation list source.